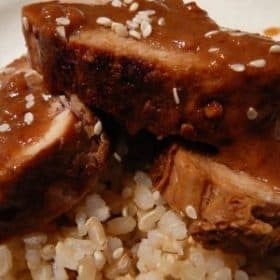 Pam at For the Love of Cooking posted this recipe for Korean Style Pork Tenderloin on her blog recently and it looked fabulous. When I read that it was also a Cooking Light recipe, I knew I had to try it. It was as good as it looked – tender with lots of flavor! The whole family loved it. Be sure and check out Pam’s post. She’s got some beautiful pictures! Thanks for sharing it! Combine the first 7 ingredients in a large zip lock bag, and add the pork. Seal and marinated in a refrigerator for 8 hours our overnight, turning bag occasionally. Preheat oven to 425 degrees. Heat a large ovenproof skillet coated with cooking spray over medium high heat. Remove pork from bag, reserving marinade. Add pork to pan, cook 6 minutes, browning on all sides. Place pan in oven, and bake at 425 degrees for 15 minutes or until meat thermometer registers 160 degrees (medium) or until desired degree of doneness. Let stand 5 minutes before slicing. Bring reserved marinade to a boil in a small saucepan. Reduce heat, and simmer 5 minutes. Cut pork into 1/4 inch thick slices and drizzle with sauce. Oooh! Tenderloin in korean style! Very delicious indeed! I am so glad you tried it…wasn’t it good? I loved how tender the meat was but also how full of flavor the marinade tasted. Thanks for giving me a shout out on your blog – I appreciate it very much. This looks great, I have a pork tenderloin sitting in the freezer right now! I might try this recipe in the crockpot. What a simple sounding delicious looking recipe. I will have to check out Pam’s blog. Pam always has great recipes! Glad you tried this one! Looks great! Great pictures! I’m definitely going to try this one. Thanks for sharing it! This is a great sounding sauce for pork. It looks really good! Gorgeous looking meal! I love this way of cooking pork!! So flavourful and tender! By the way, I’ve meme’d you. Thanks!! Delicious, I bet the pork holds the flavor quite well too :). that looks so good! i know i need to try that too after seeing it on Pam’s blog…yummy! I saw your title and I just “knew” this was from Pam! This looks so delicious!